Samsung Electronics and Speedo International are helping swimmers across the globe track their activity with access to Speedo’s best-in-class swimming platform, Speedo On. 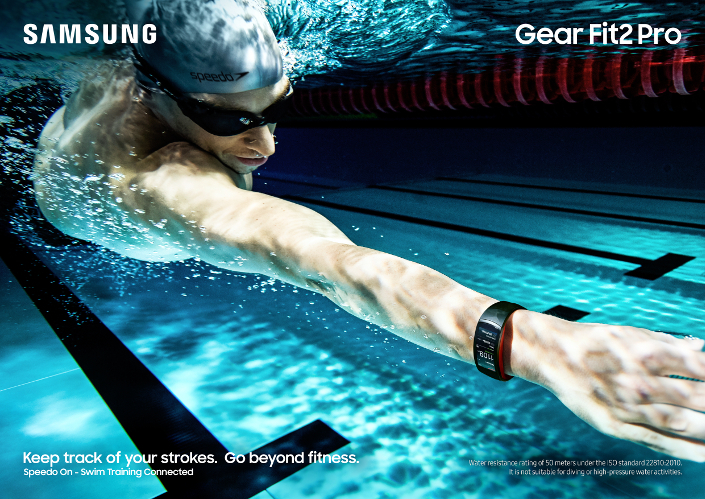 The Speedo On swim tracking app will be featured on Samsung’s new Gear Sport and Gear Fit2 Pro. Both devices are 5 ATM certified for water resistance in up to 50-meters of water. With instant access to Speedo On, the Gear Sport and Gear Fit2 Pro become the ideal companion for any swim. The Speedo On tracking app measures key swim metrics including lap count, lap time and stroke type to easily track and incorporate swim achievements into personal fitness goals. Paired with the two new devices, consumers have options for what works best to complement their activity needs in the water; Gear Sport is a sleek and stylish smartwatch with premium features while the Gear Fit2 Pro is an all-new ergonomic fitness band with continuous heart rate monitoring and GPS tracking. The data from Speedo On is also compatible with Samsung Health, Samsung’s comprehensive fitness tracking platform, to deliver a broader picture of health and wellness information. The new Samsung Gear Fit2 Pro features the Speedo On swim tracking app pre-installed, which is powered by Speedo’s expertly developed algorithm for optimum accuracy and seamless data transfer into the Speedo On web-based platform. Developed for data-driven fitness swimmers, the interactive swim tracking platform acts as a comprehensive training partner. It offers analysis of your swims and tracks your progress against your fitness goals, along with additional training programs, tips and advice tailored to you – developed by some of the world’s best coaches and athletes. Speedo On, also gives swimming a social dimension, allowing you to follow other swimmers, take part in challenges and share achievements. On both the Samsung Gear Sport and Gear Fit2 Pro the Speedo On app enables swimmers to complete time trials and get their SWOLF score (a swim efficiency measure). The world’s leading swimwear brand, Speedo is passionate about life in and around the water, creating revolutionary new technologies, designs and innovations and supporting swimming from grass-roots through to elite level. In the 1920s Speedo made history with the Racerback: the world’s first non-wool suit. In 2008 Speedo redefined swimwear again with Fastskin LZR RACER – the fastest and most technologically advanced swimsuit ever created. In 2015, Speedo launched the Fastskin LZR Racer X, the first suit engineered to help swimmers feel their fastest. Its development was made possible through analyses of the physical and psychological aspects of competitive swimming with over 330 elite swimmers. Speedo is owned by Speedo Holdings B.V and distributed in over 170 countries around the world; to find out more visit: www.speedo.com. SPEEDO, the ARROW device, FASTSKIN, AQUALAB, RACING SYSTEM, BIOFUSE, SPEEDO ENDURANCE, SCULPTURE and LZR RACER are registered trademarks of Speedo Holdings B.V. The LZR RACER suit has worldwide design rights and patents. The FASTSKIN3 cap, goggle and suit have worldwide design rights and patents pending. Speedo On is available on Android, iOS and web https://on.speedo.com. Speedo On is the new swim training platform from Speedo. Designed to improve the swimming experience and get more people swimming, more often. Users will be able to enjoy personalized recommendations to keep them on track towards their goals, motivated to carry on, and focusing on the best ways for them, personally, to be at their best.